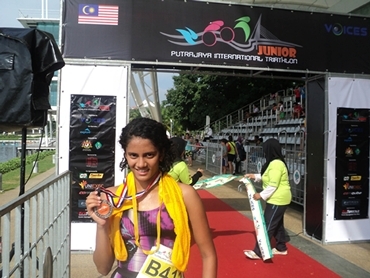 Swapnali Yadav of India clocked an impressive aggregate time to win a silver medal in the Putrajaya Junior International Triathlon 2012, at the Water Sports Complex, Putrajaya, Malaysia on Sunday. 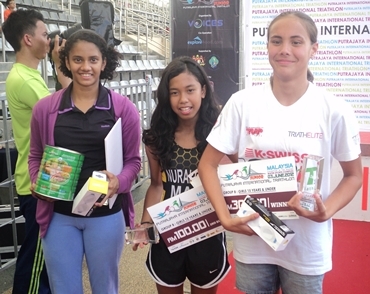 Thirteen-year-old Swapnali finished behind gold winner Zoe Bowden of the host nation, while Nuralia Mohammed Shamsir, also of Malaysia, won the bronze in the 15 years-and-under category for girls. 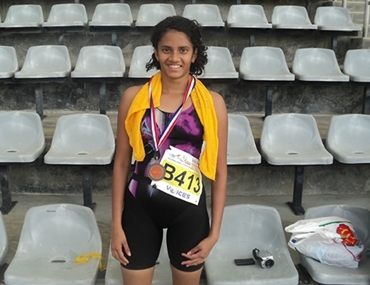 Swapnali did the 300m swim in 0:05:01 seconds, cycled 8km in 0:16:41 and the 2km run in 0:11:23s for an aggregate time of 0:33:05 seconds. Fifteen-year-old Bowden, who recently won the Asian Cup International Triathlon in the Philippines where Swapnali finished sixth, won in 0:29:17s, while Shamsir was third in 0:33:46s. There were 169 participants from all over the world, including Macau, Thailand, China, Japan, Great Britain, Australia, Netherlands, USA and Malaysia. "I am very happy with my performance. The competition was tough and I gave it my all towards the end to push Nuralia to the third place," said Swapnali from Malaysia. "I tried not to make the mistakes I had in the Asian Cup and this was a much better effort." Swapnali was all praise for Bowden. "Zoe is a fantastic athlete, as she has proved by winning gold in the Asian Cup and here. I have learnt a lot from her in such a short time. I am sure I will get better as I participate in more such competitions. "As I said, my eyes are on the Commonwealth Games and the 2016 Olympics and I am working towards my goal," added Swapnali. Results: Girls: 15 years & under: 1. Zoe Natasha Bowden (Mal) - 0:29:17 seconds; 2. Swapnali Yadav (India) - 0:33:05; 3. Nuralia Mohd. Shamsir (Mal) - 0:33:46.